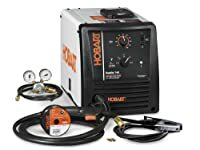 Just Welding Supplies proudly offers the Hobart brand on Welding Supplies - Welding Equipment, Plasma Cutters, MIG Welders & More. The brand includes products in the following categories: Arc welders, Arc welding equipment, Gas welders, Mig welders, Mig welding equipment, Plasma cutters, Tig welders, Welding helmets, Welding rods This brand offers excellent welding supplies and equipment for your every day welding or professional welding needs. Please send a message if you cannot find a product.